We’re a month into the school year and the kids are settling in well. 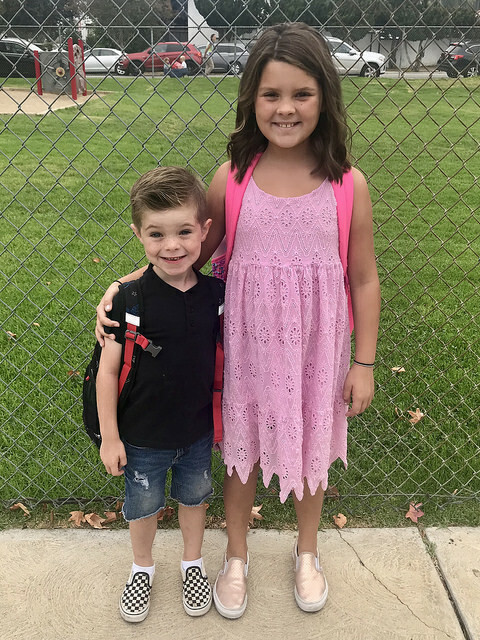 Annie has started her 8,000 different school-related activities, and James is figuring out the new system and routine of a kindergarten classroom. They both have FANTASTIC teachers who we adore and couldn’t be more perfect for each of them if I’d designed their characteristics myself. Annie’s teacher is creative and challenges her, while James’ teacher is so patient it blows my mind. I’m going to be volunteering in their classrooms starting next week and I’m looking forward to seeing them all in action. ~What Do We Owe Her Now? ~Trying to Assimilate Into a New Country? Good Luck—Most of the Rules Are Unwritten. Back in June, my awesome friends at Chevy loaned me their Bolt EV. I’ve never even driven a hybrid, so I was intrigued by driving a totally electric car. I LOVED it. It was so quiet! And other than the fact that I had to plug it in, it drove and felt like a “regular” car. And the kids were OBSESSED with it. I would seriously consider getting a Bolt if I wasn’t always schlepping my kids, their friends, and all of their sports stuff around town! I was able to borrow the car over my birthday week, so my Chevy pals (who also knew I’d just finished our 6-days-a-week all-star season) sent the car out along with a gift certificate to a spa! It was the perfect treat for my birthday, and you better believe I practically moved into the spa on my birthday. I was so relaxed I didn’t want to leave. I’ve already started Christmas shopping! Don’t hate me! ~I bought James this Wall Coasters kit…I think he’s going to love constructing different courses! ~Annie is going to get a book about how to draw cute things, which I know she’ll adore. ~If you know anyone who likes to wear funny shirts, I discovered this brand on Zulily that makes some really clever things. James had on a shirt from them the other day and so many people asked me where I got it! PS is Anyone getting a new iPhone? I’m due for an upgrade but holy schnikies are they expensive this year! I have bought a couple fun shirts from there, love them! It’s funny I drive a hybrid car and it too is super quiet but it’s the one feature I really don’t like about the car. Maybe it’s because i am a city dweller, but there is something about a car that you can’t hear coming up on you, if you’re crossing a street or something, that I find super scary. There is zero reaction time to save yourself.